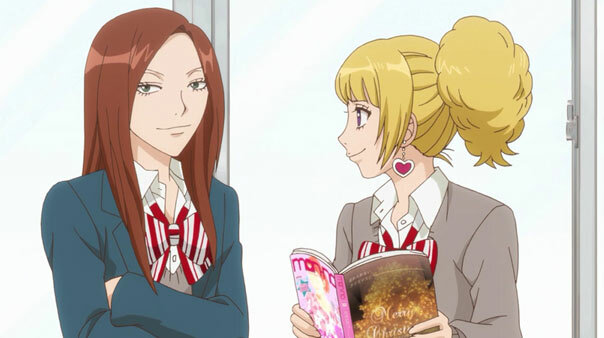 Aki and Marin reminded us so much of futaba’s superficial friends of Ao Haru Ride, I thought Erika would eventually go on a similar “realness” trip and dump them, but to the show’s credit, they’re keeping them around, only their role has changed. Now instead of being slightly annoyed by them talking about their boyfriends, Erika is jealous of their happiness with pliable boyfriends, not hard to crack nut like Kyoya. Jeez, has it only been five episodes? Things are moving along so well on Ookami Shoujo. I feel like most shows like it take an entire cour to get to where Kyoya and Erika are romantically even though there’s still much work to be done and fresh obstacles on the horizons. I say “work”, but as the next episode music suggests, Erika’s struggle is a battle, one to wrench open Kyoya’s heart and conquer it. Making that happen starts with believing it can be done, because despairing at his imposing gates, believing their impregnable-looking surface, will only lead to defeat. While going over her ideal Christmas (which is pretty standard: cake, fried chicken, gifts, being together), Kyoya complains on more than one occasion that “women are a pain”, and Erika agrees. He’s not wrong; women are a pain…but so are men. Especially Kyoya. 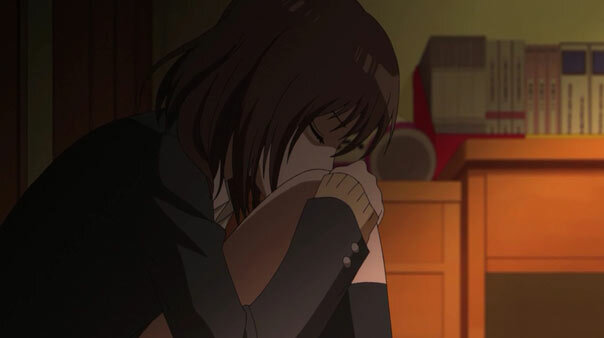 After touching cheeks during their staged Christmas selfie she promised to send to Aki and Marin (a promise she cares about keeping) and going to a cafe to warm up, Erika gets a stomachache, then asks Kyoya a direct question in an attempt to quell it: “What am I to you?” Is she nothing but a useful servant? A convenient toy? Does he care about her? Erika is essentially scrambling up Kyoya’s ramparts here, blind to all the defenses he has waiting for her at the top; defenses she’s seen before. 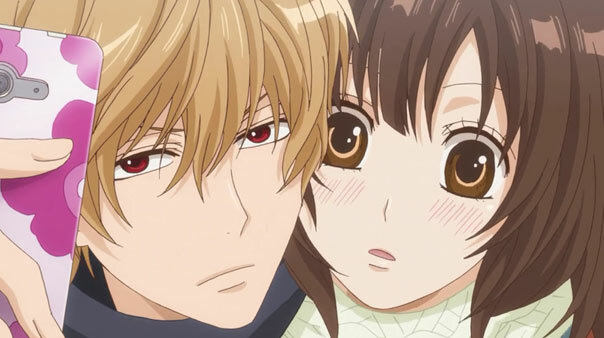 Her own defenses drop completely when Kyoya gives her precisely the perfect response of her dreams: He likes her, always has, but has been to shy to come out and say it, and the nervousness that builds from that pressure led to all of the nasty teasing. When she asks him to have a silly cliche Christmas night with her, he agrees without complaint, saying that whatever will be fun if it’s done with her. I’ll admit, my defenses were lowered too, this went on so long. Then evil shadows form on his face and he admits to just messing with her, calling it a “monkey show” and mocking her gullibility. In other words, he pours hot pitch down upon her, and she falls back down to the base of the wall. 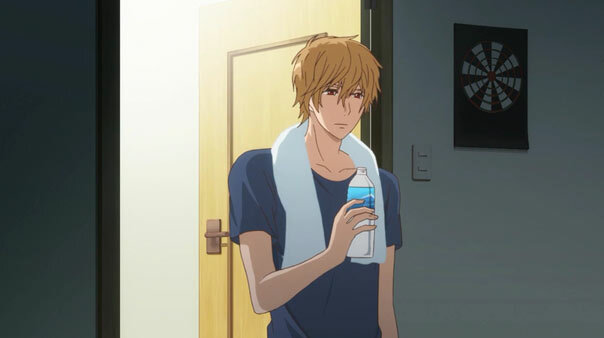 Kyoya gets a glass of ice water to the face. He’s a terrible piece of trash, Erika shouts, and she hopes he dies, storming out in a public display. Men aren’t just a “pain” to women (and vice versa) because they make you jump through hoops, or interpret things without sufficient information from your perspective: they’re a literal emotional and physical pain. A pain in the gut, A dull burning in the heart. Kyoya cuts deeper there than he ever had before, and I feel Erika’s pain clearly, having been there as we all have. Here’s the maddening thing about Kyoya: he cruelly passed his sweet and sincere confession off as false, but it wasn’t the content of the confession that was really false; only the florid presentation. Confessing like that isn’t Kyoya’s style; it’s far outside is comfort zone where he picks on and teases and runs down Erika because, almost like a little boy who likes a girl, he doesn’t know how to process what he’s feeling, and that frustration causes him to lash out. It’s pretty textbook stuff…but Kyoya isn’t a little boy anymore, and he knows he went to far. Erika’s parents are really chill. They didn’t even make the couple keep the door open! But in fixing things, which is what he wants it wouldn’t do him any good to pretend he’s comfortable (yet) saying the kinds of things that made Kyoya so happy she cried. 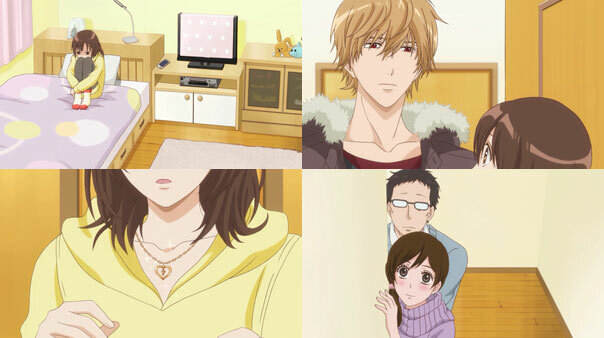 No, he atones in the most Sata Kyoya way possible: announcing himself as her boyfriend to her folks, coming into Erika’s room, demanding an apology for her throwing water and wanting him to die, and slapping a “collar” – or rather, a cute gold necklace, around her neck, so everyone knows she’s his. He resorts to his code. BAAAAAAAAAW. So f-ing cute. 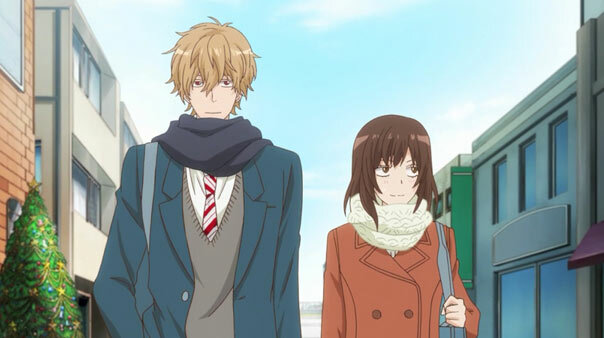 And hey, we finally learn Aki and Marin’s boyfriends are REAL! 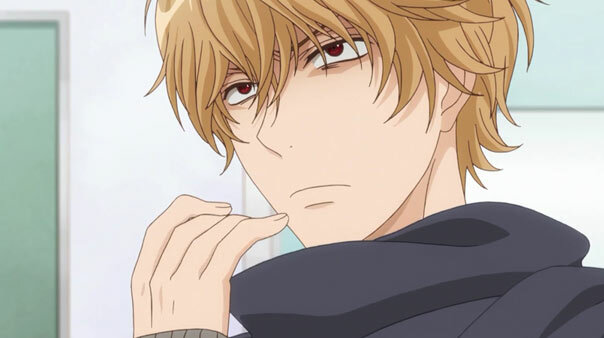 The impregnable defense Kyoya maintains is as false and deceptive as the psych-out that got water thrown in his face. Erika hasn’t busted open the gates to brought her main force in yet, but she did sneak over the walls, and found that she’s always had a place there. 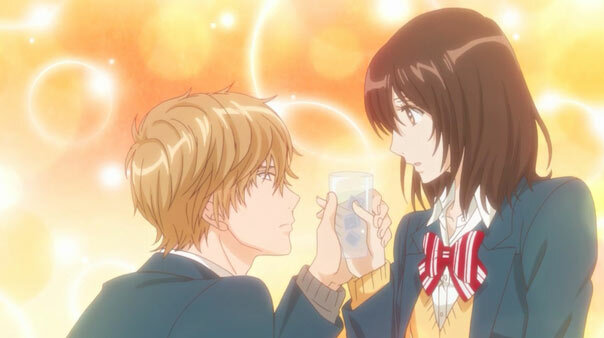 He won the battle in the cafe, but she won the battle after that, when Kyoya comes to her and, in his way, apologizes and tries to make things right. Like me, Erika chooses to believe what Kyoya said, because that was him going out on a limb, before retreating and laughing it off as a joke. But, yeah, the war isn’t over. 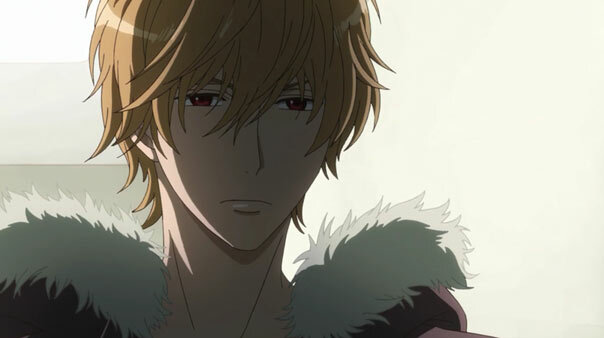 Post-credits, we see Kyoya returning home to a ringing phone. After the answering machine prompt, the caller hangs up without a word. Who was this? Kyoya’s parent? A stalker or ex-girlfriend-gone-bad? My two guesses: either a red herring cliffhanger to be quickly resolved next week (less likely) or…trouble (more likely). Trouble for Kyoya, trouble for Erika, trouble for Kyoya+Erika, and trouble for me.